Designed for your Apple Pencil - Built-in Apple Pencil holder, grab your Apple Pencil effortlessly whenever you want, easily to carry your Apple pencil with your device (Apple Pencil is NOT included). 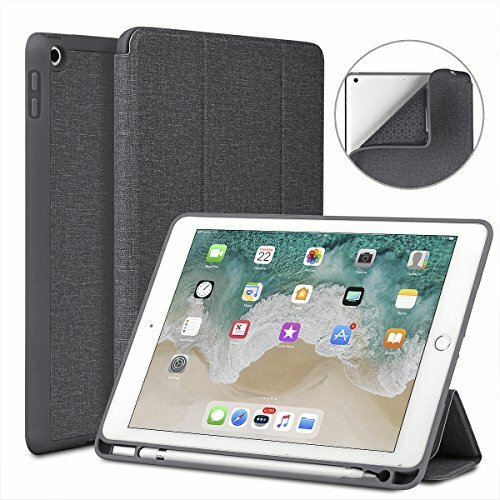 Designed for Full Protection - Soft TPU back shell protect your iPad 9.7 from shocks, drops and impacts. Soft microfiber lining with PU leather exterior, prevent your tablet from scratched. Designed for Trifold Stand - You can easily prop up the ipad with dual standing positions for enjoy the most comfortable keyboard-typing and movie-viewing. If you have any questions about this product by Soke, contact us by completing and submitting the form below. If you are looking for a specif part number, please include it with your message.